It was such an honor to work with these artists as the curator for this show and to invite you to see their compelling works. Stop by and check it out during open gallery hours and join us for the Artist Reception on September 20! It was an honor to unveil a new Climate Art and Action Project at the Festival of the Steh-Chass's youth camp yesterday. I worked with over 30 youth, discussing climate change, sea level rise, and the impacts they are already witnessing. And, of course, solutions. The smoke from western forest fires had only recently cleared and was fresh in their minds. It was easy to see that for many of them, climate change was all too real, and all too daunting. Yet they responded not just with worries and anxiety, which I imagine most of us have in the face of this looming threat, but with Hope. Am I a writer? Not a real writer, I think to myself. I mean, I’ve never written a book or anything. I have always been a reader… Escaping the reality of a tiny life with words that inspire and challenge the constant flow of my own words writing stories to myself. Well, I think to myself, not really stories…simple reflections of a tiny life; a young girl’s worries and self-doubts. What comes to mind when you think of a wastewater treatment plant? I would bet it’s not a LEED Platinum rated building housing a science center and award-winning education programs. The LOTT Clean Water Alliance in downtown Olympia is pretty unique, and is recognized internationally as a utility of the future. This means we pioneer innovative technologies and cutting-edge practices, with a focus on resource recovery, efficiency, sustainability, and community engagement. I recently updated my artist statement for a proposal and thought I would share! My artworks explore the interface between participant, viewer, and subject, resulting in immersive works that compel change. They are process oriented, drawing from relevant environmental and social issues. The finished artworks themselves are multi-layered, pulling the viewer in. The underlying collaboration and community participation is Art in Action. 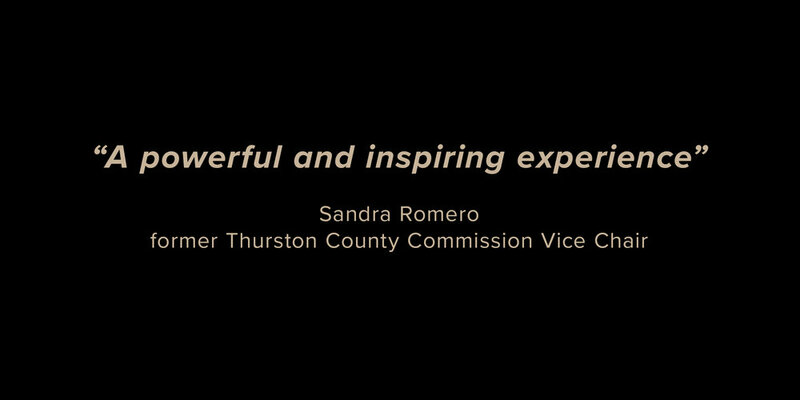 It is exciting, and a little scary, to embark on this collaborative art-venture with the Thurston County Food Bank. There are so many unknowns. I know that it will result in a permanent exterior art installation and involve over 1,000 people along the way. I am thrilled to share this news with you: I was chosen to lead a groundbreaking project for the Thurston County Food Bank, as their Artist in Residence! This would not have been possible without the support of so many amazing people.